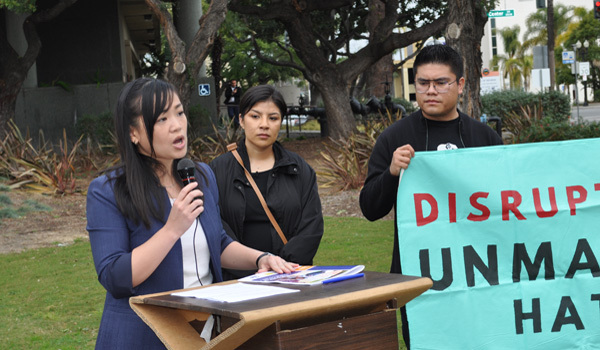 UCI Law Prof. Annie Lai delivers remarks on The State of Orange County report at a press conference in Santa Ana, Calif.
On January 7, 2019, the UCI Law Immigrant Rights Clinic, the Immigrant Legal Resource Center and Resilience OC held a press conference to release a major report on the state of immigration enforcement in Orange County. The report presents new data about the impact of Orange County’s immigration policies and provides a guide for policymakers to a more inclusive future. Read the press release and report: The State of Orange County. Read the story in the Orange County Register.